After the great success of his Hydroelectric AC equipment designs at Niagara Falls, Tesla was determined to proceed with a new form of telegraphic communication. Early in 1901, with financing from multi-millionaire J.P. Morgan, Nikola Tesla purchased 200 acres on Long Island’s north shore from Mr. James Warden, near Route 25A. 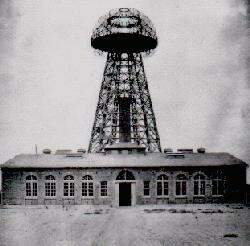 The site became known as Wardenclyffe after the original owner. In 1906, the post office and several buildings became the Village of Shoreham, N.Y. The purpose of this laboratory was to establish a wireless telegraphy plant. In 1995, members of Friends of Science East, Inc., inspired by the work of Nikola Tesla, set a goal of acquiring at least a part of this historic site with Tesla’s laboratory, to preserve it and transform the property into a new regional science center.